New Delhi, Jan 3: At least eight flights were diverted and take-offs were suspended for two hours at the IGI airport here on Thursday due to dense fog and poor visibility, officials said. 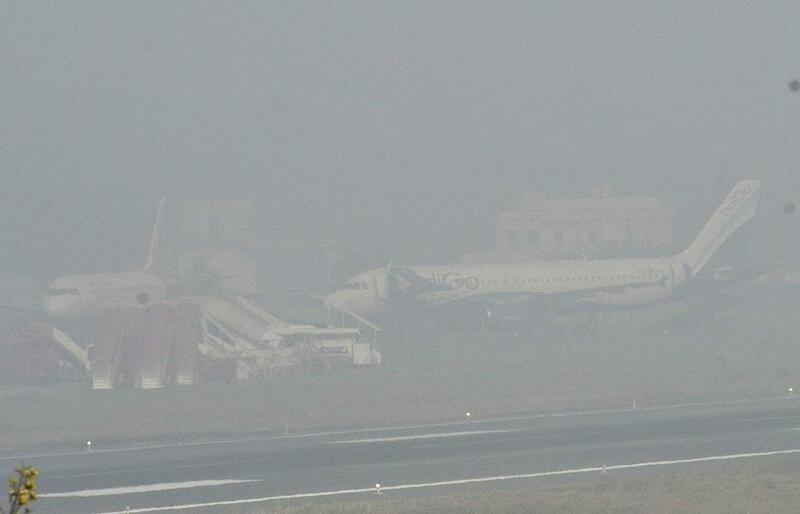 A Delhi International Airport Limited (DIAL) official told IANS: "Eight flights have been diverted due to low visibility at the Indira Gandhi International (IGI) Airport on Thursday morning." He also said the departures of aircraft were suspended from 7.30 a.m. to 9.30 a.m. According to the weather office, visibility in Palam area on Thursday morning dipped to 50 metres and in Safdarjung area to about 350 meters. Aircraft require a minimum visibility of 120 metres for taking off and landing. Besides, the movement of trains was also hit in the national capital due to dense fog in several parts of northern India. "At least 12 trains have been delayed due to fog conditions," a Northern Railway official said. He said Ahmedabad-New Delhi Rajdhani Express, Sealdah-New Delhi Duranto Express, Swatantra Senani Express have been delayed by over 2.5 hours, while Bhubaneswar-New Delhi Duranto Express was running late by more three hours. According to an NR official, Puri-New Delhi Purushottam Express and Brahmaputra Mail were running behind schedule by six hours. "Gaya-New Delhi Mahabodhi Express and Howrah-New Delhi Poorva Express have been delayed by 4.5 hours," he said. Delhi witnessed a cold Thursday morning with the minimum temperature recorded at 6.7 degrees Celsius, one notch below the season's average. The maximum temperature is expected to hover around 23 degrees Celsius. The humidity at 8.30 a.m. was 100 per cent. The pollution level remained 'severe' for the second consecutive day with the air quality index being at 492, according to the System of Air Quality and Weather Forecasting And Research. The major pollutants were PM 2.5 and PM 10.